October has passed and the days are getting shorter and shorter. For the last month or so Christmas displays have been slowly occupying more space at retailers. The holiday season is upon us. 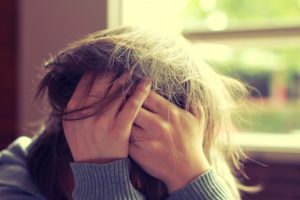 “It’s the most wonderful time of the year,” or so the old song goes, but it can also be the most stressful time of the year. On top of our already busy schedules we are all preparing for the festivities, visiting family and friends, and shopping (oh so much shopping). This is the time of year that retailers begin to see a profit (hence Black Friday), and other industries are working to wrap up projects before heading into the new year. With all of this going on it’s easy to become stressed. During what is marketed as the most joyful time of the year, how can we best cope with stress during the holiday season? Good Question! Stress is very difficult to define because it can differ from person to person. What may cause one person great anticipation and agitation, can cause little to no effect on others. Public speaking is a common stressor for many people, however for some speaking in front of others is enjoyable and easy. There are also good stressors. Good stress or eustress is caused by beneficial emotions like excitement and in anticipation of positive events like riding a roller coaster or preparing for a big date. During the holiday season there is a lot of eustress around as well. If you are like I am, preparing your home for family visits or the excitement of decorating the Christmas tree are things you look forward to this time of year. So what causes stress? Again, that’s a rough question to answer as it varies from person to person. 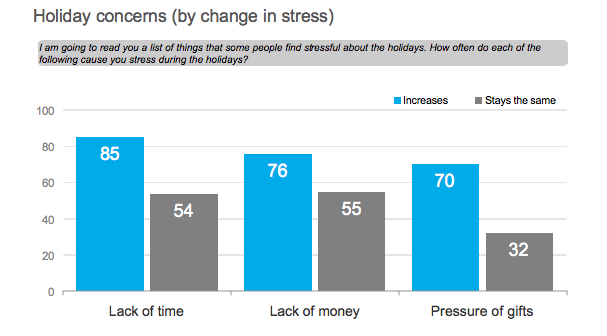 There are some common stressors though, especially during the holidays, like money, family, time management issues. The American Psychological Association put together a report in 2006 outlining how holiday stressors impact us; of those interviewed for the report 85% stated that lack of time is their greatest cause of stress during the this time of year. Take time to breathe: During the holidays we can feel like there is not enough time to get all of our tasks done and lose ourselves in the throngs of fellow shoppers at the store. By taking a moment to just breathe and center yourself you can renew your focus and conquer your tasks. Exercise: If you are feeling frustrated and restless work off your anger and excess energy by working out. My go to activity during stressful times is running. It gives me time to myself and I literally run off my stress. If you aren’t up for a heavy cardio session or the weather isn’t cooperative, think about yoga (you can do some breathing during this too), or walking on the treadmill. Treat yourself: You’ve spent all day shopping for others grab yourself something nice, maybe some nice comfy PJs to snuggle up in later. Or, maybe you need some you time, pick up a candle/bubble bath in your favorite scent and take a bath that will soothe your aching muscles. Make time for yourself and for sleep: This time of year the days grow shorter (don’t forget to move those clocks back this weekend!) and our lists of tasks grow longer. As you are running around completing your to-do list, make sure you pencil in time for yourself to relax and prepare for sleep. If you can set aside at least a half an hour before bed to unwind. Make sure this time does not include your cell phone or computer where you can be distracted by work, or holiday project planning. Take time to laugh: Though sometimes our friends and family can be the cause of our stress, they can also help us cope with it. During this busy time take the time to actually enjoy your company and have a good laugh. That’s what this season is about anyways, fellowship and joy! Don’t let the stress of the coming holiday season get to you. Remember to take time to breathe and enjoy those around you. This time of year is about togetherness more than it is about the present and decorations. Did we miss anything? What stresses you out most during this time of the year, and how do you deal with it? Please share with us!